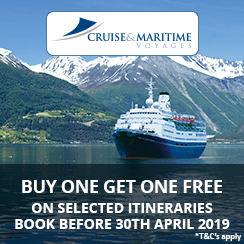 Book a selected Cruise & Maritime Voyages sailing before 30th April 2019 and you can enjoy Buy One Get One Free on cruise fares. This means your second passenger sales free with a full paying first passenger. These offers won't be around for long so call now to discover which great itinararies are included. Terms and Conditions apply – see the Campaign Terms for full details. More and more cruise passengers are choosing to sail from the UK and starting their holiday from the moment they step aboard. 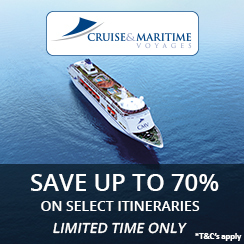 Cruise & Maritime Voyages has been quick to recognise this and to provide an exciting and varied programme of convenient regional departures from no less than eight British ports: Bristol Avonmouth, Leith, Greenock, Rosyth, Hull, Liverpool, London Tilbury and Newcastle Tyne - bringing cruising closer to home. A Laugh on the Ocean Waves On selected cruises, enjoy ‘A Laugh on the Ocean Waves’ where you are invited to enjoy the talents of Cruise & Maritime's guest comedians. Laughter is the best medicine so enjoy the talents of the comedy acts with their dedicated evening shows, hear them talk about their life experience and listen to their Comedy Corner interviews with the Cruise Director. Overnight & Lunch Events On selected cruises, Overnight and Lunch events are organised so you can make the most out of each port visited. Cabin accommodation, full board cuisine afternoon teas, daytime activities, evening entertainment and full use of all the on board leisure facilities are all included in the fare. Cruise & Maritime Voyages aim to offer a more traditional and leisurely 'country house' style cruising and maritime experience aboard their classic cruise ships, Marco Polo, Discovery and Astor. Their emphasis is very much on providing attentive service within a 'home from home' atmosphere. Cruise & Maritime Voyages recognise the importance of offering a very high standard of evening entertainment brought to you by experienced Cruise Directors and entertainment hosts. It is their aim to ensure that you have an unforgettable cruise holiday and present a truly wonderful and varied entertainment programme. The relaxing atmosphere created by CMV is ideal for enjoying their extensive programme of guest speakers, entertainers and craft specialists. Their Additions Programme presents a range of complimentary activities and entertainment in addition to what is already on offer onboard.